The physics of floatation has been understood since Archimedes cried “Eureka!” and leapt inspired from his bath. Objects float if they weigh less than the water they displace when they are fully submerged. The strength of their buoyancy depends on their average density relative to the density of the water. A cicada beats its wings in the surface film. Yet Archimedes and his bathwater have been strangely absent from the dry fly mythology that developed from the late 19th century. The mayfly imitation supposedly rides so lightly that it is almost entirely above the water. 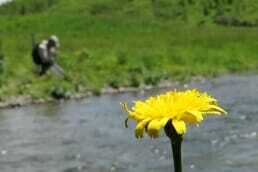 It falls and settles gently and then sits up as perkily as thistledown. 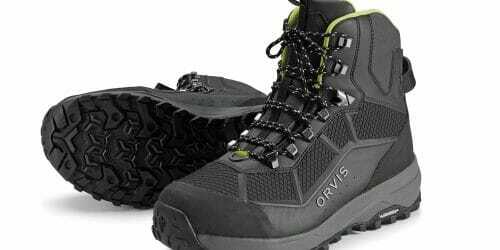 It is supported by the points of its hackles, the tips of its tail fibres and a small part of the heel of the hook, which does no more than slightly indent the surface. The classic demonstration of surface tension involves floating a needle. Harry McClelland’s influential fly-tying manual The Trout Fly Dresser’s Cabinet of Devices (1898) advised readers to ‘Place a dry fly carefully on the surface of water, and in an upright or “cocked” position. Its “displacement” is very small indeed, little more than the bend of the hook being under water… The elastic skin will support the weight of the fly if it has been constructed to fall so gently as to not break through the skin of the water.’ Its weight is distributed ‘so evenly on the skin as to be easily borne up’, preventing the skin from ‘creeping’ over it. 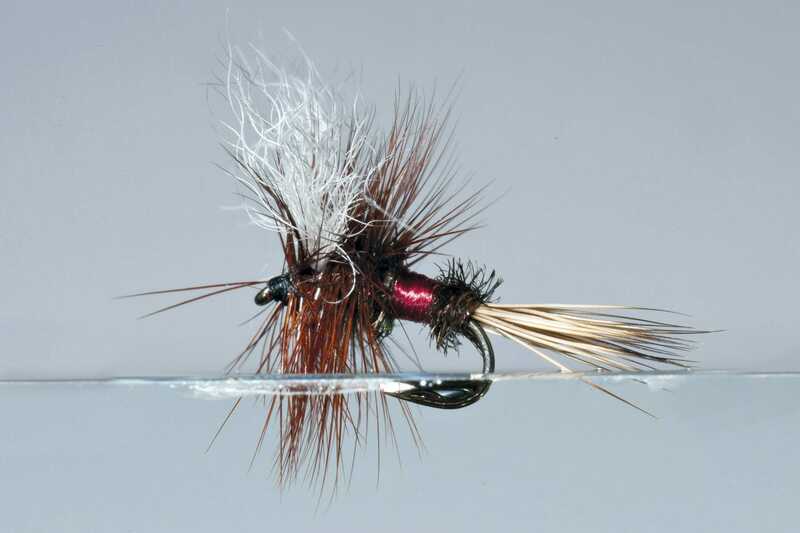 Although McClelland described placing the fly carefully on the water, he claimed that it sits in the same way when it falls onto the water. His explanation was that its hackles ‘afford greater resistance to descent, and thus decrease the impetus with which the fly strikes the water. The split wings, acting like a parachute, also contribute to produce the same result.’ However, real-life parachutists know that however perfect their landing, it is anything but impact-free. And like parachutists, hooks have mass. The mass of a hook is related to its size and the gauge of its wire. Physics tells us that when the diameter of a wire or fibre is doubled, it becomes four times stronger and 16 times stiffer. As a very rough guide, each stepwise increase in hook size (say #14 to #12) is usually associated with about a 20 per cent increase in mass. Yet the diameter, strength and stiffness of the supporting hackle and tail fibres does not increase proportionately. More importantly still, a fly is constructed around a hook, not a straight length of steel, and a large part of the mass of any hook is concentrated in its bend. A small fly hook can certainly be placed so that it lies horizontally — bend and all — on the surface film. But in fly fishing the hook is not placed on the water. It drops to the water, and as it drops it tilts down bend-first. 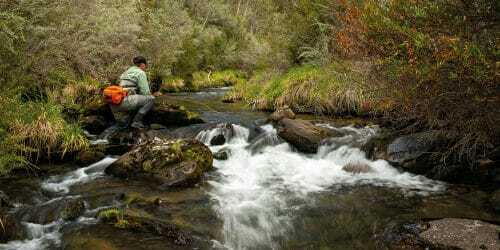 For the classic dry fly, this is a major problem. Although surface tension is enough to support a needle placed on the water sideways, it is not enough to resist the much greater force-per-unit-area of a needle placed (let alone dropped) end-on. And what are more like needle points than the tips of stiff hackle fibres dropping to meet the water surface more or less vertically, like those directly under the hook-shank? This is true even of thistledown, which is all struts and no guts and perceived as having virtually no mass at all. 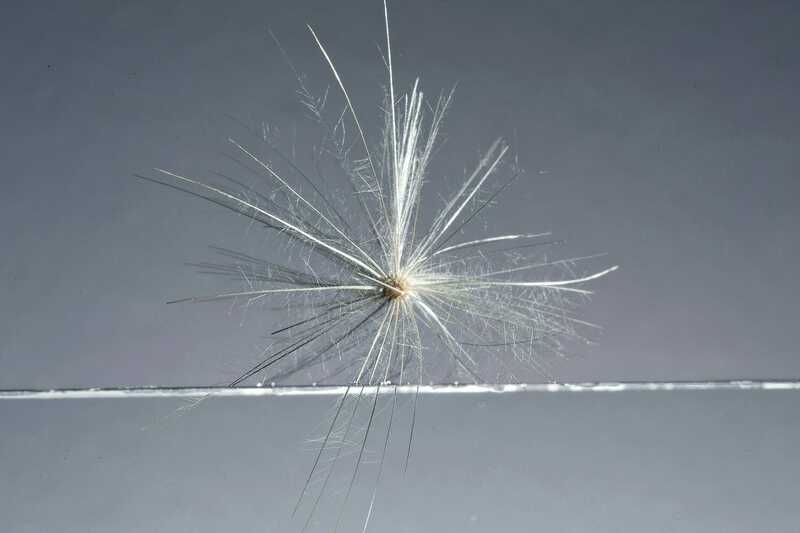 The specimens that ride highest are those with fibres that are curved rather than straight: the thistledown settles on the water supported by the length of those fibres resting on the surface film (Fig. 1). If the fibres are straight, however, their tips sooner or later penetrate the film (Fig. 2). 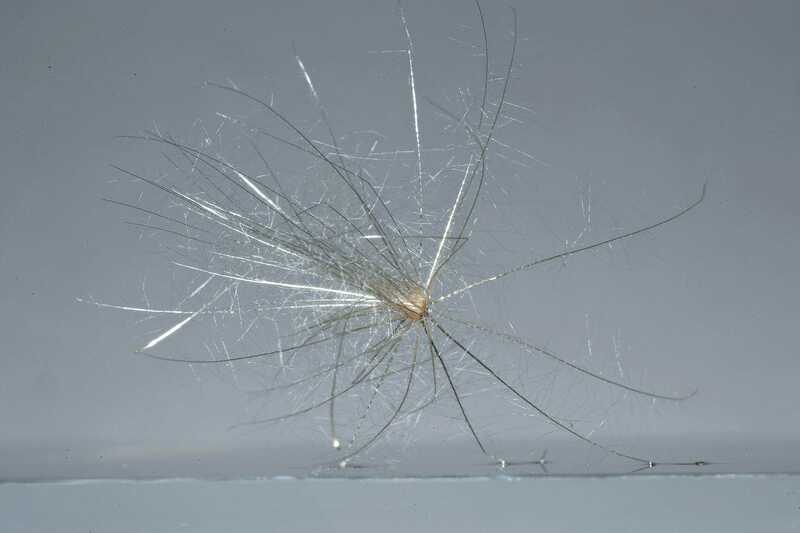 The thistledown then sinks until it is supported by those fibres that meet the surface at only a small angle. This is also true of the hackled dry fly. 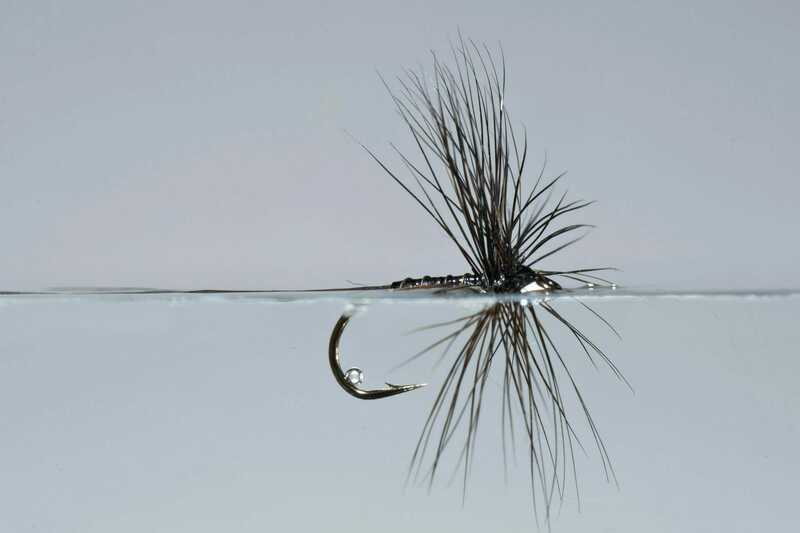 Some photographs and illustrations purport to show a dry resting elegantly on water supported on the tips of its hackle and tails, and a small part of the lower hook bend. But they are beautiful lies. They capture only what happens when the fly is carefully and gently placed on water to produce the desired effect. Trevor Foon once built a water-filled glass tank into which we cast and photographed a wide range of commercially and privately tied dry flies, using a mini-rod and leader. The results confirmed all the faults of the traditional design, and of various alternatives to it. Later we discovered it was unnecessary to actually cast the fly. 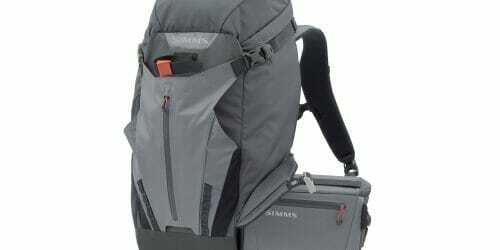 For all practical purposes, the results are little different if it is simply dropped from a height of an inch or two. If anything, they tend to be more favourable than those in which it is attached to a leader. Any curve in a tippet, and any change in tippet-fly angle due to rotational slippage of the knot joining tippet to hook eye, can affect the angle at which a fly descends and lands and how it sits on the water. Our own photographs show what occurs when three different fly patterns, selected because of their different structural features, are put to the test. All the flies had been pre-treated with silicone spray floatant three days previously, the period recommended to achieve maximum water-resistance. We began with several heavily-hackled commercially-tied Royal Wulffs in various sizes. The highest initial float was provided by those in #16 (Fig. 3), no doubt due to the more favourable ratio of hook mass to volume of buoyant material. However, despite moisture being carefully removed before each later descent, the flies quickly sat progressively lower (Fig. 4 & 5). For technical photographic reasons, the final image in the sequence shows a different individual fly. But it is representative of what eventually happened with every Wulff: they floated with their bodies flush in the surface film (Fig. 6). 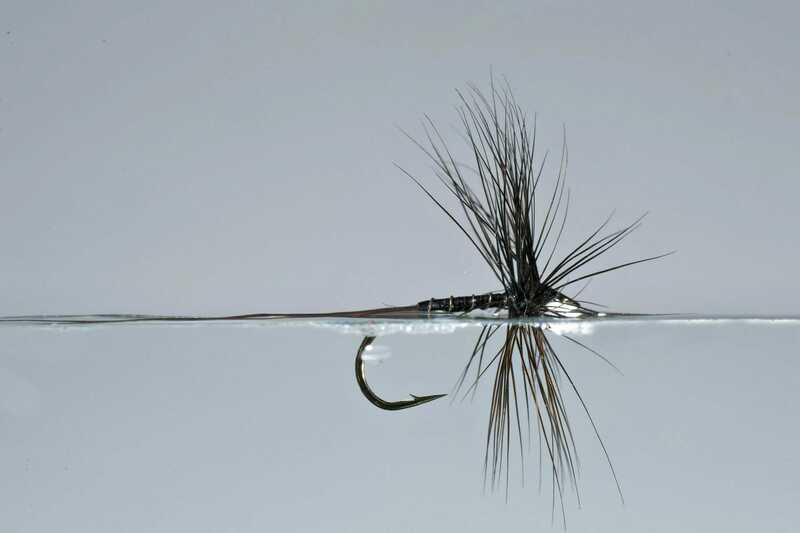 For contrast, we then tried a sparsely-dressed Black Spinner featuring premium hackle and stiff tails of moose hair. On first drop it floated high, with the mass of the hook bend supported by the tails, but the tips of the hackle well submerged (Fig. 7). With each later descent it too sat progressively lower in the water until the body lay flush in the surface film (Fig. 8 & 9). Even palmers are no exception. Take the famous Macquarie Red, devised by Tasmania’s Max Christensen in the late 1950s. The pattern’s success with active fish early in a hatch was attributed to its perceived high float, but in this respect the hook was equally important as the hackles. Max used a #13 English mayfly hook. At that time, the ‘long May’ style was very long-shanked and proportionately narrow-gaped: total hook length was 3.6 or more times the width of the gape, depending on the manufacturer. The reduced gape meant the hook was significantly lighter than others of the same length, and the centre of mass was shifted further forward where the hackles could support it more directly. Long Mays were later re-modelled with a shorter shank and wider gape, and were only marketed in larger sizes. Since the death in 2013 of the last of the traditional English hook-makers, Vince Green of Sprite, even these have now disappeared. Commercial Macquaries have for many years been tied on conventional long-shank dry fly hooks with a much wider gape and heavier bend. This does them no favours. The test specimen was tied instead on a #14 Tiemco 5263. Although designated as a nymph hook, technological advances mean that it is no heavier than Max’s original ‘long May’ hook. It differs only microscopically in hook length and gape, and it has the turned-down eye Max was on record as preferring if the option had been available to him. The Macquarie floated high on its initial drop test (Fig. 10), but subsequently behaved like the other flies (Fig. 11 & 12). To an angler some ten metres away this is not detectable, and the palmer’s high visibility creates an illusion that it is riding higher than it really is. 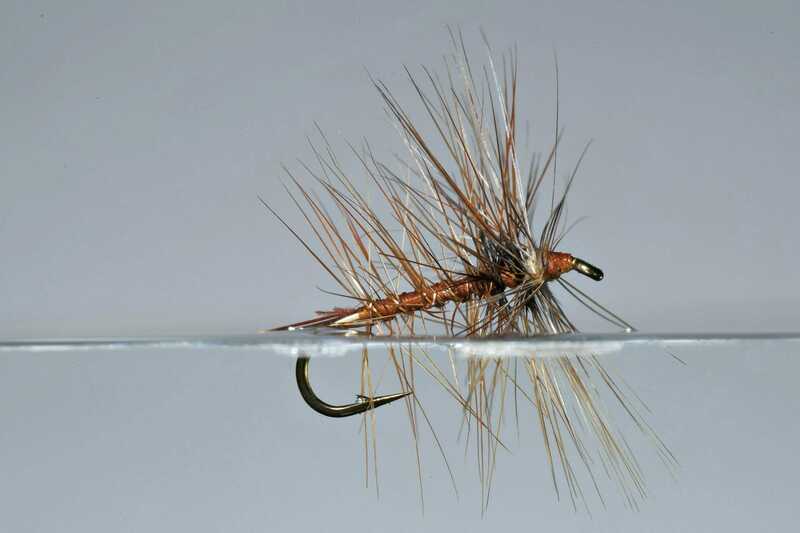 It could certainly be expected to stay afloat longer than standard flies, due to the greater number of supporting hackle fibres resting horizontally on the surface. However, anglers wanting to ensure that their Macquaries really do float high should carry several in their box, and rotate to a fresh fly if the occasion demands. Some anglers’ preconceptions are so strong that they will resort to any excuse to dismiss all this. The hackles were inferior. The flies were poorly or wrongly tied, or were not delivered gently enough. None of these objections are sustainable, and the experiment is replicable by anyone with a large glass bowl and an open mind. In every case the same sequence of events unfolds. 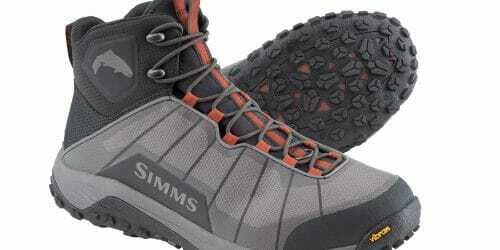 As any dry fly hits the water, the hook’s lower bend penetrates the surface film. The depth of penetration relates to its velocity. This is greater than you would expect, even in what seem the most delicate touchdowns when viewed from casting distance. Almost simultaneously, the tips of those hackle fibres located vertically underneath the hook pierce the film. They are followed by the tips of surrounding hackle fibres until most of the lower semicircle of hackle is submerged. The fly is then supported by its tails, by the rear two-thirds of its body, and by most of the length of those hackle fibres extending from the hook at an angle no more than 10–15 degrees below horizontal. 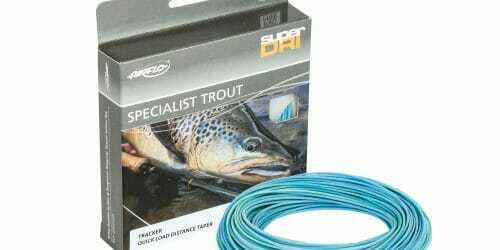 These fibres support the hook because for most of their length they lie on the surface film, as opposed to spearing through it. These near-lateral fibres function as cantilever springs. As the weight of the hook pushes them over much of their length against the tension of the water’s surface film, deflecting them slightly, they store energy and push back. The slight upward tilt of the fly towards the front of its body is produced not by front-end support alone, but also by the mass of the hook bend tilting the rear of the fly body down at an angle. The simple experiment of cutting off the entire lower hook bend will confirm this. Far from riding higher, as you might expect, a fly so amputated rides flush on the surface film. 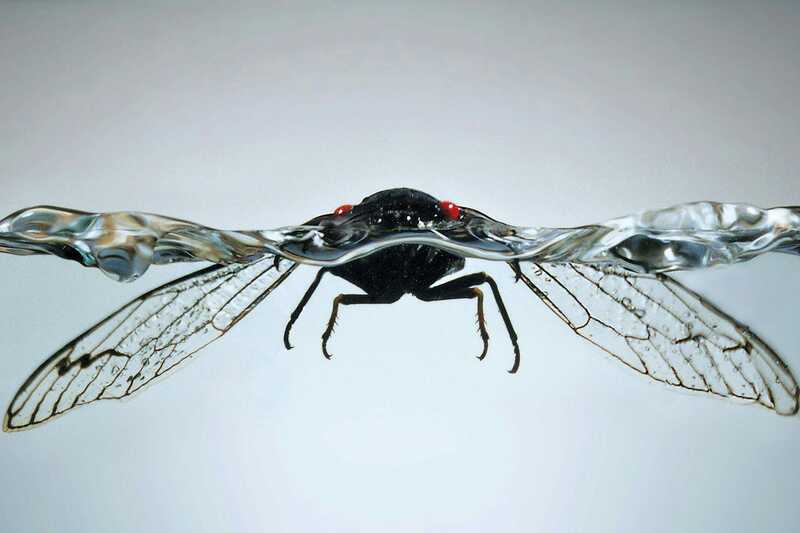 In reality, a fly’s cantilevers only temporarily support the front part of its body fractionally clear of the surface. Within a few further casts and landings — despite vigorous false-casting — it slumps down with all its body resting on the surface. The entire lower semicircle of hackle is by then submerged, and the hackle support comes from those fibres lying horizontally in the surface film. 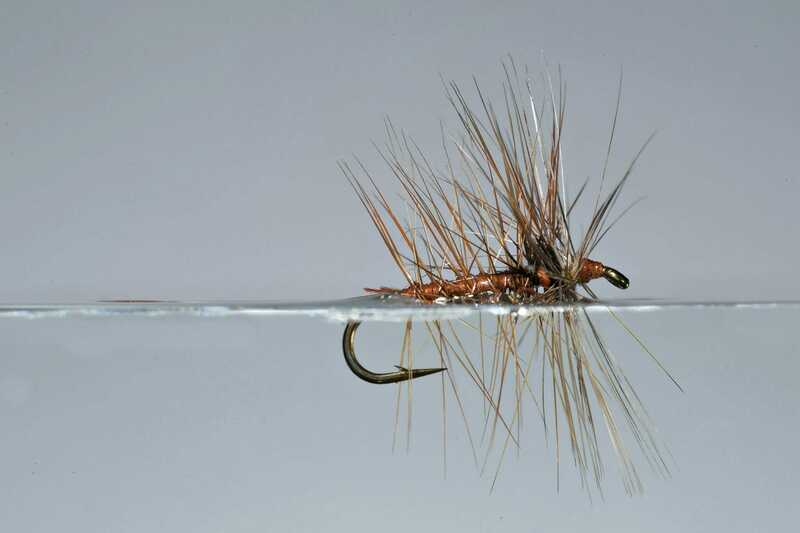 In the most mechanically efficient alternative dry fly design, the parachute, all the hackle fibres lie horizontally in the surface film. When that point is reached, Archimedes re-enters. Although the outstretched fibres help spread the load over more area, the normal laws of buoyancy prevail. Ultimately the fly floats if its average density (specific gravity) is less than that of water, and sinks if its average density is greater than water. The density of water is rated at 1 gram per cubic centimetre and the density of steel at 7.8 grams per cubic centimetre. So floating flies need to trap as much air (density 0.00153 g/cm³ at sea level and 15°C) as possible. This can be achieved by using body materials that retain air because of a hollow or cellular inner structure, or because of the way they are applied to the hook, or both. Air is also trapped between the dense hackle fibres immediately adjacent to the hook, and any dubbing fibres in the same area. In fibrous materials the inevitable progressive displacement of air by water can be delayed by first applying floatant. But even this will not support the fly above the surface film. What it does extremely well is to greatly extend the time a fly will remain supported on or in the film. 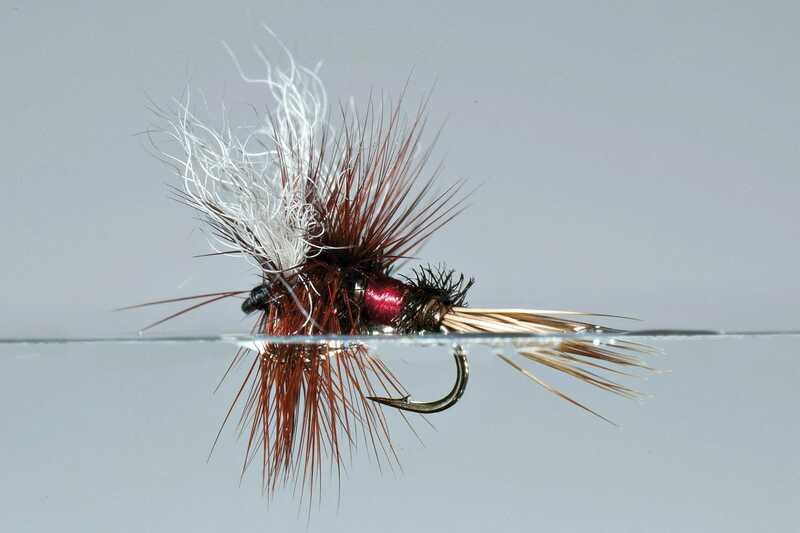 Classic hackle dry flies have pretensions to be ballerinas, but in the end they are flat-footed belly-floppers. Despite this, or perhaps because of it, they have caught countless billions of trout. The drowned hackle and even the hook bend may draw the attention of fish from a distance and perhaps also suggest a part-vacated nymphal shuck, particularly if the body eventually sinks right through the surface film and slants down at an angle. In other words, viewed from underwater by fish, traditional dries may often be interpreted as emergers. If so, it has been achieved only by accident. Modern emergers are purpose-built to achieve a superior posture and image, and to reliably repeat it every time they are presented to a fish. But that is another story. 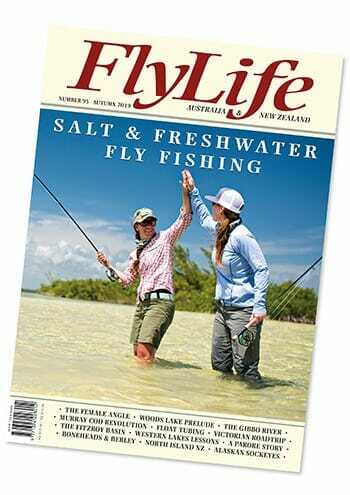 First published in 1995, FlyLife is widely regarded as the finest collectable journal on fly fishing. Featuring high-quality full-gloss pages filled with glorious colour photos and the very best writing in print, FlyLife is also available in digital form on mobile devices.